If you’re a business owner or homeowner looking for serious 20kW power the DR20I4 is what you’ve been looking for! 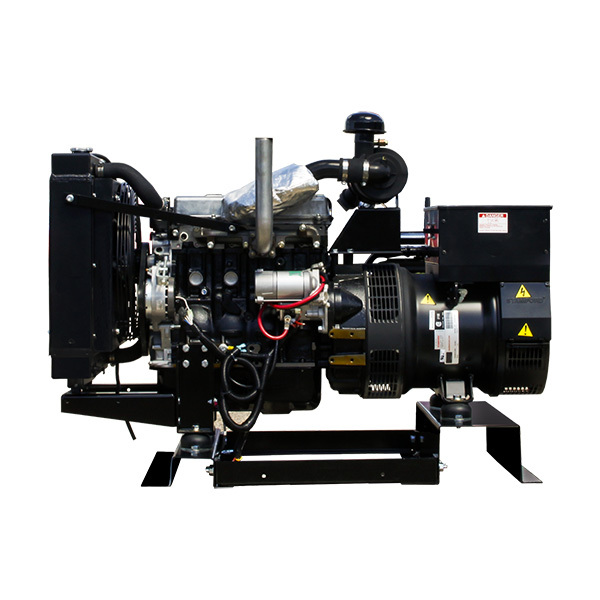 Winpower utilizes the Isuzu 2.2L engine which has been used in industrial applications for years to give end users the confidence of performance and reliability. Whether using this unit for standby or for prime power, you can rest assured you are getting the best product on the market. NEMA 1 Enclosure Standard – NEMA 3R provides additional weather protection for outdoor use. 14 gauge galvaneal steel with internal baffling and 1″ foam for sound attenuation and weather protection. All fuel tanks, except the 54 gallon, are double walled. 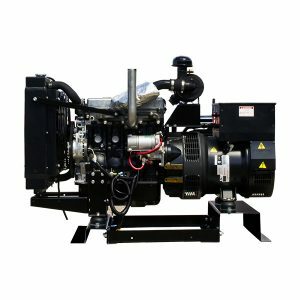 All gensets are 1800 rpm and equipped with mainline circuit breaker, block heater, battery charger, oil drain and coolant drain extensions, standard muffler and stainless steel flex, UL / CSA digital genset controller with remote start standard. Isuzu 4LE1 2.2 Liter Engine - Dependable 4 cylinder, 1800 RPM, EPA compliant, Tier 4 interim. Deep Sea 7310 Controller - Digital controller providing immediate performance information and safety shutdowns. Stamford Generator End - Alternators built to product clean power for industrial applications. Powder Coat Paint - Incredibly durable and long lasting finish. Battery Charger - Guest 2 Amp charger comes standard. 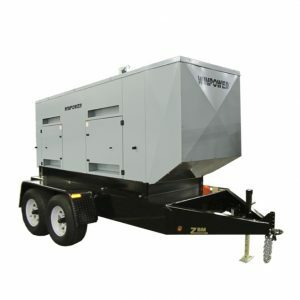 UL2200 Listed - A safety standard for the design, construction, and performance of stationary generators. 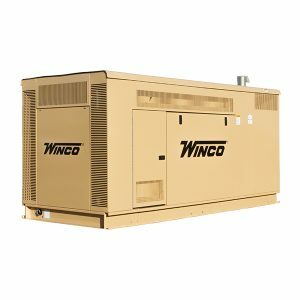 100% Load Tested - Winco load tests every generator before it leaves the factory. Asco 300 Series Auto Transfer Switch - 104 Amp (For 1-PH or 3-PH Models) - Safely restore power to critical circuits. NFPA 110 Level 1 - Factory installed. Includes remote annunciator, DSE 10 Amp battery charger, and low coolant alarm. Excitation Boost System - Factory installed. Provides excitation power for heavy loads or short circuits. Permanent Magnet Generator 1% Regulation - Factory installed. Device that converts mechanical energy to electrical energy. In this device the rotor windings have been replaced with permanent magnets. Permanent Magnet Generator 5% Regulation - Factory installed. Device that converts mechanical energy to electrical energy. In this device the rotor windings have been replaced with permanent magnets. Battery Charger Upgrade - Factory installed. Upgrade from the standard 2 Amp charge to a 5 Amp or 10 Amp with fail contact or 10 Amp NFPA compliant. Generator Strip Heater - Factory installed. Reduces condensation. Battery - Group 24 650 CCA. 20 Lbs. Fuel Tank - Base mounted steel tanks include double wall secondary containment construction. 10 gauge main tank and 7 gauge outer, UL 142 listing, electrical stub up, removable end channel, four point lifting, normal/emergency vents, supply/return, level gauge, alarms for low fuel and leak detection. *54 gallon composite fuel tank is not UL 142 listed. All tanks, except the 54 gallon, are double walled. Trailer - DOT approved trailers with steel fenders. An integrated single wall fuel tank and standard electric brakes make this trailer one of the most popular models in the business. Receptacle package ((2) 50 amp CS6365C plug and (2) NEMA 5-20 duplex) standard with trailer. Standard black paint. DSE2548 Remote Annunciator -This is a remote annunciator that has 16 configured LED's and works up to 1 KM (0.6 miles) away from the host controller. Up to five of these modules can be hooked-up to one host controller. 5 Lbs. DSE2510 Remote Display Panel -The Remote Display Panel is a display module designed to work with the DSE7310 Auto Start Failure control modules. Up to three display modules can be connected to one host control module, and can be positioned up to a maximum distance of 1km away. The remote displays offer exactly the same instrumentation, control and monitoring capabilities as the host control module, including starting and stopping of the engine. All remote displays connected to the same system, will show the same information at any one time, while the host controller is able to display different information. The modules are simple to operate and feature the same user-friendly menu layout as the host module. All communications and configuration are done via the host module only. The remote devices simply mirror the configuration of the host module, making the system quick and easy to install. 10 Lbs. DSE890 WebNet Gateway - Remote Communications & Overview Displays allow you to control/monitor your generator from your smartphone, tablet or computer. 1 Lb. DSE2157 Expandable Outputs - Factory installed. Output relay expansion module designed to give greater output flexibility when trying to meet complex industry generator control specifications. The module includes eight configurable relay contacts with LED indicators. These can be configured as 4 normally open and 4 normally closed. All configurations are controlled within the host control module. DSE2130 Expandable Inputs - Factory installed. Input expansion module designed to give greater flexibility when trying to meet complex industry generator control specifications. The module includes eight digital inputs. Four of these can be configured for use as analogue inputs. All configurations are controlled within the host control module.